Make it an unforgettable birthday with designer invitations. Start making history together with personalized invitations that are as beautiful as they are memorable. These fun baby shower invitations are perfect for a girl, a boy or a surprise. Celebrate your grad with party invites worthy of a cap toss. Every special occasion begins with a fun party invitation to set the tone. No matter the type of celebration, Shutterfly has you covered with a wonderful array of invitation styles and designs that will help bring your party to life. You can choose invitations based on party themes, such as a luau or ice cream social, or you can find an invitation that has the exact color palette that you want for your party. Birthdays are always a milestone and Shutterfly carries more than enough invitation options to inspire your big day! You can choose from elegant adult birthday party invitations with lovely cursive or opt for invitations with gold or silver foil-stamped accents to increase the glam. 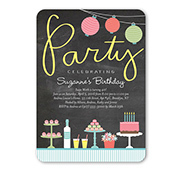 If you’re planning a huge party for the little ones, Shutterfly offers plenty of birthday invitations for kids that are inspired by popular childrens’ party themes such as fire trucks, superheroes, animals, pirates, outerspace, and more. 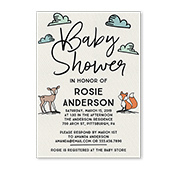 When it comes to planning a shower for the mama-to-be, explore creative baby shower invitations that are charming, with adorable sayings such as “ready to pop” or “baby on the way.” Choose baby shower invitations with baby animals, flowers, polka dots, or woodland characters to turn your invitation into a full party theme later on. If you’ve been tasked with hosting a bridal shower, you can use the color scheme from your invitation for all of your decor and sweets. 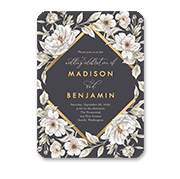 Honor the bride-to-be with dainty pink and white invitations or chic black and gold striped invitations. Graduation is another special occasion that deserves a personalized graduation party invitation to set the mood for an unforgettable celebration. 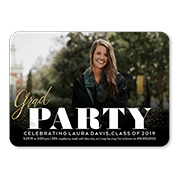 Use the graduate’s lovely grad photos to create a classy graduation party invitation that will surprise recipients and remind them of how far the graduate has come. Are you planning a celebration for a coworker or loved one who is retiring from a long and fruitful career? You might be interested in exploring our retirement party ideas, which include themes, favors, and more. After all is said and done, don’t forget to send guests a warm thank you card after your special occasion to let them know how much you appreciate their gifts and time. Party planning can be a hard process but choosing the perfect invitation from the start will save you some time while showing off your party personality.